Cosmonauts Oleg Kotov and Sergey Ryazanskiy successfully re-installed a high-resolution video camera on the hull of the International Space Station Monday, but a problem of some sort prevented a second, lower-resolution camera from sending telemetry to the ground. After multiple attempts to resolve the problem by disconnecting and re-mating several power and data cables -- and completing two other unrelated tasks -- the cosmonauts were told to collect their tools and return to the Pirs airlock module. 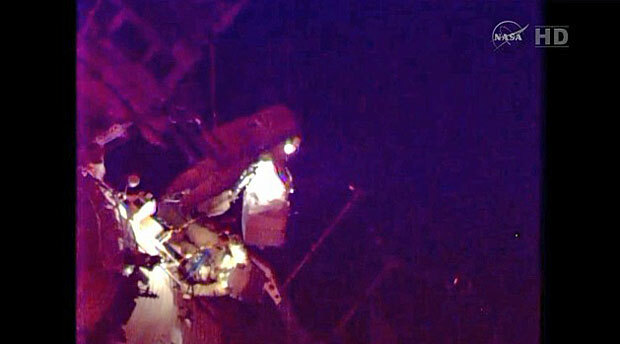 The hatch was closed at 3:08 p.m. EST (GMT-5), ending a six-hour and eight-minute spacewalk. "Well, at least one of them is working, and that's a big deal," one of the spacewalkers radioed. It was the second spacewalk in a row to install the cameras for UrtheCast, a Vancouver-based company that plans to beam down Earth views to subscribers around the world as part of a commercial venture in cooperation with Roscosmos, the Russian federal space agency. During a Dec. 27 spacewalk, internal and external cabling problems prevented telemetry from either camera from making it to the ground. Both cameras were hauled back inside the space station and post-spacewalk troubleshooting seemed to identify two separate issues. The cosmonauts reconfigured internal cabling to correct the problem with the high-resolution camera. As for the medium-resolution camera, engineers concluded the problem was the result of cables that apparently were not connected to the proper plugs in a so-called "patch panel" in the hull of the Zvezda command module. During Monday's spacewalk, Kotov and Ryazanskiy had no problems attaching the high-resolution camera to a steerable aiming platform and making the required electrical connections. Flight controllers quickly confirmed they were receiving steady telemetry. The cosmonauts then re-installed the medium-resolution camera on a fixed mounting plate near its high-resolution counterpart and proceeded to make a series of electrical connections. They then traced the power lines to the patch panel to confirm they were properly plugged in. But flight controllers did not receive the expected telemetry. Ryazanskiy then was asked to disconnect and re-mate a suspect cable where it plugged into the patch panel. That didn't resolve the problem, so he disconnected and re-mated two additional cables in a bid to enable a steady stream of telemetry. Again, flight controllers said they were not receiving the expected data. While Ryazanskiy worked with the cabling, Kotov retrieved a NASA spacewalk tool with a disconnected locking pin and then collected a space exposure experiment, the only other items on the crew's timeline. Flight controllers, meanwhile, told the cosmonauts to head back to the Pirs airlock and to leave the cameras in place. It was not immediately known if the problem affecting the medium-resolution camera can be corrected from inside the space station. But flight controllers told the cosmonauts that a third spacewalk was not in the cards. "I do not believe the connector is not mated," someone, presumably one of the spacewalkers, radioed Russian flight controllers in a live translation. "Well, the connectors are pretty obvious, it's impossible to connect them incorrectly," someone said. "We have confirmed that the connectors are mated, we have re-mated the connectors and (we will) let them look for what is going on. At least, I've been told there is not going to be another telescope EVA." "OK, copy," one of the spacewalkers replied. It was not immediately known what impact the camera problem might have on UrtheCast and its plans to begin commercial operations later this year. The medium-resolution camera was intended to provide a fixed view of the ground 260 miles below, capable of distinguishing surface features roughly 16 feet across in 25-mile-wide strips of imagery. The high-resolution 4K camera, attached to an aiming mechanism installed during an earlier spacewalk, can be pointed at specific targets. It can distinguish objects as small as 3.3 feet across. UrtheCast plans to provide a free stream of basic imagery while more specific targeting requests will be billed at yet-to-be-specified rates. But the company's business model is based on two operational cameras and it's not yet known what it might take to fix the medium-resolution imager or how long that might take. "An ongoing telemetry issue of some sort, not understood yet by the flight control team ... has proved to be an obstacle toward complete success for today's spacewalk," said NASA mission control commentator Rob Navias at the Johnson Space Center in Houston. "That medium-resolution camera ... is not providing a stream of telemetry to the ground, apparently, and the flight control team in Korolev (near Moscow) will have to scratch its heads and consider other courses of troubleshooting. They will not conduct another spacewalk to deal with the cameras." Today's spacewalk was the 178th devoted to station assembly and maintenance since construction began in 1998, the first so far this year, the sixth for Kotov and the third for Ryazanskiy. One hundred and 14 astronauts and cosmonauts representing nine nations have now logged 1,121 hours and 52 minutes of station EVA time, or 46.7 days. Kotov's total now stands at 36 hours and 51 minutes, moving him up to 29th on the list of most experienced spacewalkers. After successfully re-installing a high-definition video camera on the hull of the International Space Station, cosmonauts Oleg Kotov and Sergey Ryazanskiy re-attached a medium-resolution still camera but ran into problems getting telemetry back to the ground. The camera initially appeared to be properly connected, but Russian flight controllers later said telemetry was intermittent and Ryazanskiy was asked to disconnect and remate a suspect cable where it plugged into a "patch panel" on the Zvezda command module. That didn't resolve the problem, so he disconnected and remated two additional cables in a bid to enable a steady stream of telemetry. Vancouver-based UrtheCast plans to use the cameras in a commercial venture to deliver high-definition Earth views to subscribers around the world. An attempt to install the cameras during a Dec. 27 spacewalk failed because of suspected cabling problems that prevented telemetry from reaching the ground. This time around, Kotov and Ryazanskiy had no problems hooking up the high-resolution 4K video camera and flight controllers said it appeared to be working normally. Engineers concluded the original problem with the video camera was incorrect cable connections inside the space station. But the medium-resolution camera's problems were thought to be in the exterior cabling. Engineers were confident they understood the problem and that the cosmonauts would be able to properly connect the camera, but a problem somewhere in the system continued to block the desired telemetry. 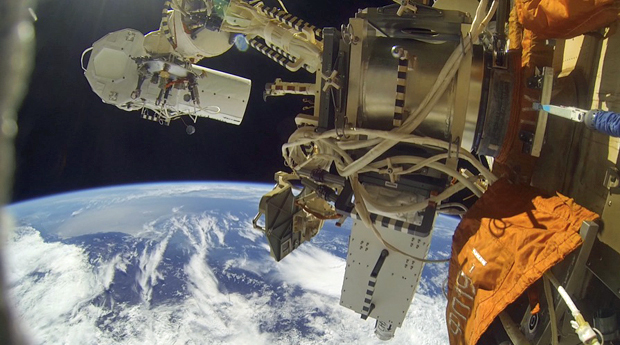 While Ryazanskiy worked with the medium-resolution camera's cabling, Kotov retrieved a NASA spacewalk tool with a disconnected locking pin and then collected a space exposure experiment. Four hours and 45 minutes into the spacewalk, the only item left on the crew's timeline was the medium-resolution camera. Cosmonauts Oleg Kotov and Sergey Ryazanskiy successfully re-installed a high-definition 4K video camera on the hull of the International Space Station's Zvezda command module Monday that will be operated by Vancouver-based UrtheCast as a commercial venture. After mounting the camera and hooking up three cables, the cosmonauts made their way to a patch panel to connect additional cables to allow video from the camera to reach the ground. Flight controllers reported a good signal and the camera installation was deemed complete. "Reports from the Russian mission control center indicate that the Russian flight control team is happy with all the data and telemetry being received from the high-resolution camera," said NASA mission control commentator Rob Navias. "All of the eletrical connections have now been made, everything looking good." The astronauts now are working to mount a medium-resolution still camera on a fixed mounting near the base of its high-resolution counterpart. The cameras initially were installed during a Dec. 27 spacewalk, but cabling problems prevented telemetry from reaching the ground. Russian cosmonauts Oleg Kotov and Sergey Ryazanskiy opened the hatch of the Pirs airlock compartment at 9 a.m. EST (GMT-5) Monday to officially kick off a planned six-hour spacewalk outside the International Space Station. The excursion is the crew's second attempt to install two cameras for a Canadian company that plans to downlink high-definition Earth views to subscribers around the world. For identification, space station commander Kotov is using the call sign EV-1 and NASA helmet camera No. 18. 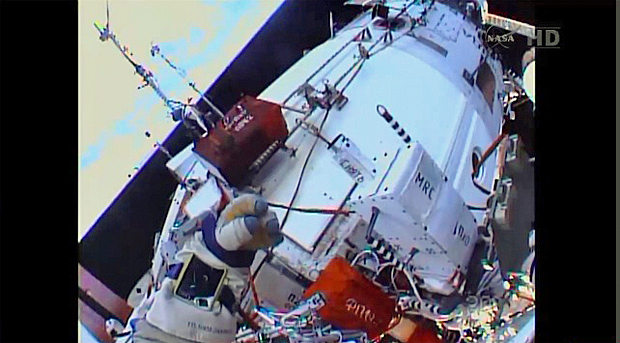 Ryazanskiy, EV-2, is using helmet camera No. 20. Both men are wearing Russian Orlan spacesuits with blue stripes. During a marathon spacewalk Dec. 27, Kotov and Ryazanskiy attempted to install a high-resolution 4K "ultra-HD" video camera on the hull of the Zvezda command module, along with a fixed-view medium-resolution still camera. While both cameras were successfully installed, Russian flight controllers did not receive expected telemetry and after extensive troubleshooting, Kotov and Ryazanskiy were told to bring both cameras back inside the station for additional inspections. Engineers later discovered the problem with the high-resolution video camera involved an internal wiring problem that was easily corrected. The problem for the medium-resolution still camera was external cabling that was not connected to the proper terminal. "The configuration that was expected by the crew and by the controllers was not what was actually there," said NASA flight director Tomas Gonzales-Torres, a veteran spacewalk planner. "When they went back and double checked some of the exterior routing, they were actually going to the wrong connector because it was in an incorrect, or unexpected, configuration. "They'll have to demate a connector and then mate it to the medium resolution camera. They're going to follow the routing of the connector to make sure it's the correct one and then the ground is going to check for proper connectivity and data and confirm that, hopefully, everything is OK."
Scott Larson, UrtheCast CEO, was confident the cameras would work as expected this time around, saying in a statement the cabling issue is "now resolved" and "we expect that the second spacewalk will result in a complete installation." Assuming the camera installation work goes well, Kotov and Ryazanskiy also plan to retrieve a Russian space exposure experiment and a NASA foot restraint mounting fixture on the station's robot arm that has a loose connector pin. But getting the two cameras installed is the primary objective of Russian EVA-37A. Vancouver-based UrtheCast (pronounced Earth Cast) developed the cameras as a commercial venture. The company says anyone with an internet connection will be able to receive pictures of selected targets using cell phones, tablets or personal computers. "Having a platform on the ISS gives us a really neutral place to let the world observe itself without having a single governmental organization control that data," Dan Lopez, Urthecast director of technology, told CBSNews.com before the first spacewalk. The medium-resolution camera will provide a fixed view of the ground 260 miles below while the high-resolution 4K camera, attached to an aiming mechanism installed during an earlier spacewalk, can be pointed at specific targets. The company plans to provide a free stream of basic imagery while more specific targeting requests will be billed at yet-to-be-specified rates. "UrtheCast's two cameras will stream unprecedented footage of our evolving Earth to anyone with an internet connection," the company says on its web page. "In near real time, you will be able to visit your favorite locales and learn about current events as they unfold." The medium-resolution camera can distinguish objects on the ground that are roughly 16 feet across or larger and will capture 25-mile-wide strips of imagery showing the planet below. The high-resolution video camera can distinguish objects as small as 3.3 feet across. Premium accounts will allow "priority camera tasking and exclusive rights to video and imagery," the company said. BC Business Online reported last year that Urthecast is promoting a programming interface that "will allow developers to build products of its live-stream, and has signed data distribution agreements worth between $19 and $21 million." Today's spacewalk is the 178th devoted to station assembly and maintenance since construction began in 1998, the sixth for Kotov and the third for Ryazanskiy. Going into the excursion, 114 astronauts and cosmonauts representing nine nations had logged 1,115 hours and 44 minutes of station EVA time, or 46.5 days. Following standard safety precautions, astronaut Mike Hopkins will spend the spacewalk restricted to Poisk module and the Soyuz TMA-10M spacecraft that carried him, Kotov and Ryazanskiy into orbit. Crewmates Koichi Wakata, Rick Mastracchio and Mikhail Tyurin will spend the day in the forward part of station where they will have access to their Soyuz TMA-11M spacecraft. The Pirs airlock compartment and the Zvezda command module it is attached to will be sealed off for the duration of the spacewalk.